The SAS (Special Air Service) Regiment is a corps of the British Army and a part of the United Kingdom Special Forces (UKSF) commanded by the Director Special Forces. The SAS Regiment actually refers to three regiments known as the 21st SAS Regiment, 22nd SAS Regiment and 23rd SAS Regiment. The 22nd SAS Regiment is a part of the Regular Army, while the 22nd and 23 regiments are a part of the reserve Territorial Army. History of the SAS Regiment dates back to the Second World War when David Stirling founded the so-called L Detachment, Special Air Service Brigade which was used to operate behind the enemy lines in North Africa. It was not a paratroop regiment with a number of units like its name suggested but it was intentionally given a misleading name so that the Axis would think that they are dealing with a number of units rather than one commando unit. For most of the war, the Stirling’s unit operated in North Africa and the Greek islands although it also fought in Sicily and Italy, and later in Western Europe. However, it was reorganized several times by 1944 when it supported the Allied advance towards Germany and meanwhile got a new commander – Paddy Mayne. He replaced David Stirling who was captured by the Germans in Tunisia in 1943. Stirling was held prisoner by the end of the war although he escaped several times before the Germans moved him to an “escape-proof” castle in the town of Colditz, Germany. 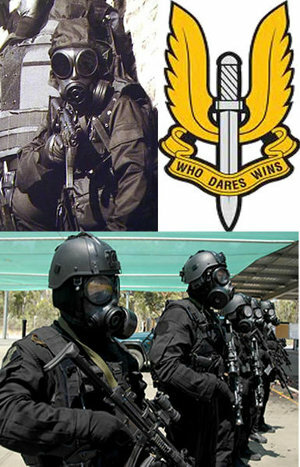 After the end of the Second World War, the British government decided that there is no need for a special air service regiment any longer and disbanded the existing 1st and 2nd SAS regiments joined in the SAS Brigade. However, the government soon changed its mind and a new SAS regiment was raised in less than two years after the end of the war. In 1952, the British government also decided to form a Regular Army SAS regiment and added the Squadron 2 (Malay Scouts) to the army list as the 22nd SAS Regiment. In 1959, another regiment – the 23rd SAS Regiment was formed and became a part of the reserve Territorial Army. From its formal formation in 1952, the 22nd SAS Regiment carried out a number of operations and private security in many parts of the world. But its best known action was the so-called Operation Nimrod which was carried out during the Iranian Embassy Siege in London in 1980. In a 17 minute action, the soldiers of the SAS Regiment rescued 24 from the remaining 25 hostages and killed 5 out of 6 terrorists without losing a single man. The members of the 22nd SAS Regiment are recruited from the UK armed forces and take part in NASM ces courses for strength and resiliance. although most of the SAS soldiers come from the airborne forces. In order to be accepted to the Regiment, the candidates have to pass a number of tests and exercises during a five-week long selection process that is held twice per year in Sennybridge in Brecon Beacons. From about 200 pre-selected candidates, only about 30 pass the selection process. The selection for the 21st and 23rd SAS regiments is less difficult although the standards for admission are quite high as well.